For the college basketball coach, see Debbie Ryan. Deborah Ann Ryan (born May 13, 1993) is an American actress and singer. Ryan started acting in professional theatres at the age of seven, and was later discovered in a nationwide search by Disney Channel. From 2008 to 2011, she starred as Bailey Pickett on The Suite Life on Deck and appeared in the Disney Channel Original Movie 16 Wishes (2010), which was the most watched cable program the day of its premiere. Ryan also appeared in the independent theatrical film What If... (2010). From 2011 to 2015, Ryan starred as the titular character on the Disney Channel television series Jessie, and appeared in the television film Radio Rebel (2012). Since 2018, she stars as Patty Bladell on the Netflix series Insatiable. Ryan gained prominence in music by contributing vocals to the soundtracks of her Disney projects and later formed the band The Never Ending in 2013, and toured with them as an opening act for the North American leg of Fifth Harmony's Reflection Tour in 2015. Ryan was born in Huntsville, Alabama. Her father was in the military, so she moved to numerous places in Europe. She lived in Germany until she was 10 and can speak both English and German. She started performing in professional theaters at the age of seven on an American base in Germany. She returned to the United States in 2003 and was raised in Texas. In a 2009 People Magazine interview, she described herself as a "nerd" in school. She was bullied in middle school for being a mascot and a member of the school's chess club. Ryan began appearing in various television commercials in her early teenage years. In 2006 she made her television debut on the show Barney and Friends. Ryan's first film role was in 2007 as a guest character in Barney: Let's Go to the Firehouse, she played the role of a teenager. She appeared in several commercials for iDog and various board games; she was in an iDog Dance commercial in 2008. Ryan also had a major role in the Metro-Goldwyn-Mayer feature film The Longshots as Edith. Ryan played one of the main characters, Bailey Pickett, on the Disney Channel Original Series, The Suite Life on Deck, which is a sequel to the hit Disney Channel series, The Suite Life of Zack & Cody. The series's pilot aired on September 26, 2008 in the United States and it became the most watched series premiere in Canada on the Family channel. The character is a very intelligent girl who boarded the ship to leave the fictional town of Kettlecorn, Kansas, where she lived on a farm, because she hated the fact that the town is so small. The series was 2008's number one top scripted television series for teens, beating the veteran series Hannah Montana and Wizards of Waverly Place in the ratings. The series was also 2009's top rated scripted series, outpacing other teenage shows. In 2009, Ryan landed a starring role in the independent feature film, What If..., alongside Kevin Sorbo and Kristy Swanson. The film was shot in Grand Rapids and Manistee, Michigan in July 2009 and was released in theaters on August 20, 2010. The film is produced by Pure Flix Entertainment and centers on a Christian family. In October 2009, Ryan hosted the first Tween Girl Summit Music Festival. 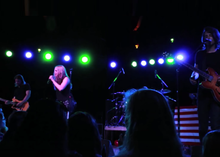 "Tween girls are drawn to talented performers who emanate the joy of life, and we are so happy to have teen favorite Debby Ryan as the first host of The Tween Summit Music Festival," said Denise Restauri, founder of The Tween Summit, AllyKatzz.com and AK Tweens. Ryan was set to headline the "Terrific Teen Tour", a concert series which co-headlined Mitchel Musso, Jasmine Richards and Savannah Outen, that would start on July 9, 2009 and end on July 14 but the tour was canceled owing to schedule conflicts. The tour would have been Ryan's debut as a live musician. In 2010, she starred in the young adult film 16 Wishes. In addition, the movie introduced Ryan to new audiences, such as the contemporary adult audience since the movie received high viewership in the adults demographic. Ryan noted that to prepare for her role in 16 Wishes, she watched numerous Brat Pack movies. On March 25, 2011, Ryan starred in The Suite Life Movie, based on the show she had starred in. On March 29, she released the promotional single "Made of Matches", theme of Discovery Family television show R.L. Stine's The Haunting Hour. The Suite Life on Deck finished its run on May 6, 2011. On July 6, she released her debut solo single, the alternative hip hop song We Ended Right, featuring Chad Hively & Chase Ryan. The song was released from her own label, the Ryan River Studio, founded with her brother, Chase Ryan. Also in 2011, it was announced that Ryan landed her own Disney Channel series called Jessie, which debuted in September 2011. The show follows a girl who moves from Texas to New York City to become a star but becomes a nanny instead for a family with four children. Jessie is a show she also helped create, relating that she wanted her character to relate to herself. Ryan directed the season three episode "Coffee Talk," making her the youngest female to ever direct a Disney Channel production. Additionally, in a shift towards a more mature role, she guest starred in an episode of the show Private Practice as a recovering drug addict. On February 17, 2012, she starred in another Disney Channel movie entitled Radio Rebel as Tara, a very shy teenage who dreads speaking to anyone in her school, but in the privacy of her bedroom, she incorporates the most famous radio persona of the internet under the nickname 'Radio Rebel'. She released a cover version of "We Got the Beat", by The Go-Go's, as the promotional single for the film on February 21. On August 31, 2012 she voiced the character Spike in the Tinker Bell film Secret of the Wings. Also in 2012, she formed the indie band The Never Ending with guitarist Kyle Moore and drummer Johnny Franco. Ryan commented that her musical style includes folk, indie pop and country. She cited as musical influences for their debut work The Lumineers, Mumford & Sons, April Smith and the Great Picture Show and Tom Petty. In 2013, Ryan starred in the film Kristin's Christmas Past as Haddie. She recorded an appearance in the film Muppets Most Wanted, released in March 21, 2014, as Savana, but the scene was deleted. The scene was later reinstated in the Blu-ray release's extended version. On June 1, Ryan and The Never Ending released their debut single, "Mulholland Drive", with a premiere on the Billboard website. Their debut EP One was released on June 24, featuring album art with a circus-theme. She also appeared in the show TV series Mighty Med as Jade and was guest mentor in the fifth season of Fashion Police. On April 17, 2015, an episode of Girl Meets World premiered featuring Ryan as Aubrey Macavoy. On June 23, 2015, The Never Ending debuted their new single, titled "Secondhand". In 2016 Ryan was cast in the NBC police series The Mysteries of Laura in season two as Lucy Diamond, Laura's drugged and trouble-making younger paternal half-sister and the half-aunt of Nicholas and Harrison. At the same time, Ryan was confirmed in the cast of comedy series Sing It!. The show debuted on May 25, 2016 at YouTube Red, a paid service of streaming original series and movies, similar to Netflix. Ryan played Holli Holiday, a famous and egocentric singer, who uses the fictional talent show Sing It! to self-promote. The character was inspired by Paula Abdul. On August 22, Ryan was confirmed to join the VH1 drama series Daytime Divas, based on the book Satan's Sisters by former The View host Star Jones. The series debuted on June 5, 2017. She will play Maddie Finn, an ex-host of The Lunch Hour and rival of Kibby, who wants to return to the show. In June 2017, Ryan announced via her Instagram account that Netflix had ordered Insatiable to series, after previously being passed on by The CW. The first season premiered on August 10, 2018. Ryan is a Christian. She plays several instruments, including the guitar, piano, and keyboard. Ryan was in a relationship with Twenty One Pilots drummer Josh Dun from May 2013 to September 2014. In a March 10, 2015 Teen Vogue interview, she revealed that her relationship with Dun was good, but she had been in an abusive relationship with someone else. She described that relationship as professional rather than romantic, but said "it was such emotional manipulation to the point where it became physical." In the interview, she stated that she decided to partner with Mary Kay and Love is Respect for their anti-domestic-violence campaign "Don't Look Away." Ryan is quoted as saying, "The second someone puts their hand on you, a boundary has been crossed." In April 2016, Ryan was arrested for driving under the influence. Initially, she was charged with felony DUI, but it was later reduced to two misdemeanors. She was released after posting $100,000 bail. On June 30, 2016, she pleaded no contest to reckless driving and was sentenced to three years of probation, community service, and a DUI program. On December 23, 2018, Twenty One Pilots drummer Josh Dun announced their engagement on his Instagram account. In a 2009 People interview, Ryan stated that her Suite Life co-star, Brenda Song, is her acting idol. In a March 2009 interview, Ryan revealed she also looks up to Meryl Streep, calling Streep "so profoundly thought-provoking and life-changing". She has said that her other role models include Anne Hathaway, Rachel McAdams, and Tobey Maguire. When asked about musical tastes, she said, "I love jazz! I love singing it. I also love country! My brother loves rock; he also has this chill Jason Mraz-like style. So basically, my answer is: jazz-country-rock-alternative? I have no idea! But I honestly would love to make country music". Ryan was involved in Disney's Friends for Change. She was featured in a commercial on Disney Channel. The charity helps explain how kids can help preserve the planet and invites them to go to the Friends for Change website to register and pledge, offering them the chance to help choose how Disney will invest $1 million in environmental programs. Ryan took part in Disney's Friends for Change Games, which featured over 30 Disney Channel and Disney XD stars competing in fun and physical challenges inspired by good actions for the environment. The stars were broken up into teams and each team played on behalf of an environmental charity. Ryan had been taking part as Captain of the Blue Team playing to benefit Ocean Conservancy. In May 2012, Ryan traveled to Udaipur, India, as part of Disney's Friends for Change's partnership with international charity Free The Children. The trip was hosted by Me to We, a social enterprise and partner of Free The Children. During her visit she volunteered to help build a new school in Lai Gow and met with local community members to learn about their culture. Her experience was filmed and aired between programs on Disney Channel starting on June 28, 2012. In July 2012, Ryan started work on a clothing line for 2013. She said she was in the beginning stages of building herself a fashion brand and revealed that she has been looking into designers and interviewing brands she might like to work with. 2009 Wizards of Waverly Place Episode: "Cast Away (To Another Show)"
Hannah Montana Episode: "Super(stitious) Girl"
R. L. Stine's The Haunting Hour: The Series Stefani Howard Episode: "Wrong Number"
PrankStars Herself Episode: "Something to Chew On"
Private Practice Hayley Episode: "The Breaking Point"
2012 Zeke and Luther Courtney Mills Episode: "There's No Business Like Bro Business"
The Glades Christa Johnson Episode: "Fountain of Youth"
Austin & Ally Jessie Prescott Episode: "Austin & Jessie & Ally All Star New Year"
Good Luck Charlie Jessie Prescott Episode: "Good Luck Jessie: NYC Christmas"
2014 Mighty Med Jade / Remix Episode: "Guitar Superhero"
Ultimate Spider-Man Jessie Prescott Voice; episode: "Halloween Night at the Museum"
Fashion Police Guest mentor Episode: "Debby Ryan and Jamie Chung"
2015 Girl Meets World Aubrey Episode: "Girl Meets Demolition"
Goldie & Bear Thumbelina Voice; episode: "Thumbulina's Wild Ride"
2017 Daytime Divas Maddie Finn Episodes: "Lunch Is on Us" and "Shut It Down"
For the discography with her band, see The Never Ending § Discography. "A Wish Comes True Everyday"
"A Wish Comes True Every Day"